Fellow crime fiction writer Annamaria Alfieri and I set off from Hakone on the H-line bus (which runs from the onsen resort town of Hakone-Yumoto to the nearby lakeside towns of Hakone-Machi and Moto-Hakone) and disembarked at Yusaka-michi Iriguchi (the Yusaka michi trailhead). 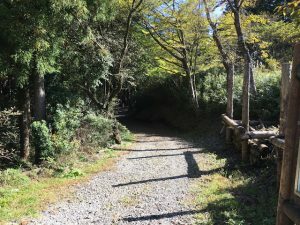 The Yusaka michi, or Yusaka trail, is an ancient Japanese travel road–older than the more famous Tōkaidō–which served a primary route for commerce and travel through the Hakone region starting in the Kamakura period (1185-1333). It fell into disuse after Shogun Tokugawa Ieyasu established the Tōkaidō during the early Edo period (1603-1868), but was still in existence during the 16th century, when my books are set. We hiked along the ancient trail, past fields of blossoming silver grass and soaring pines and cedars. The path remains broad and well traveled to this day. Along the way we also saw torikabuto plants in bloom. Also known as wolfsbane, monkshood, and aconite (Aconitum sp.) this poisonous plant grows wild in Japan and was used by poisoners long before Japan’s medieval era. It also features as the murder weapon in one of my Hiro Hattori novels – but I won’t tell you which . . . you’ll have to read* and find out for yourself! After a relatively short but enjoyable hike, Annamaria** and I reached the summit of Mt. Takanosu, her first and my 34th summit in Japan. 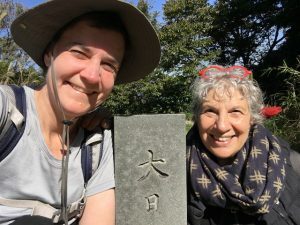 We took a quick break to enjoy the moment and then continued down the other side of the mountain toward our next goal of the day: the summit of neighboring Mount Sangen. More on that climb another day! ** Annamaria Alfieri writes fantastic mystery novels, from her standalone City of Silver and Blood Tango to her compelling series set in British East Africa. If you like crime fiction, she’s an author you should be reading – get thee to a bookery! It’s wonderful to see your journey. But I’m also very excited to hear the rumbling of the next book! I’m about to start Trial at Mount Koya. I’ve zipped through them, as I let reading be my reward for studying for the JLPT (n5). Thank you Amy! I’m so glad you’re enjoying the series and I hope you like Trial on Mount Koya too. We currently have books scheduled for the summers of 2019 and 2020, and I have quite a few more outlined, too! I’m excited to be able to make more journeys with Hiro and Father Mateo myself! And good luck on the JLPT!